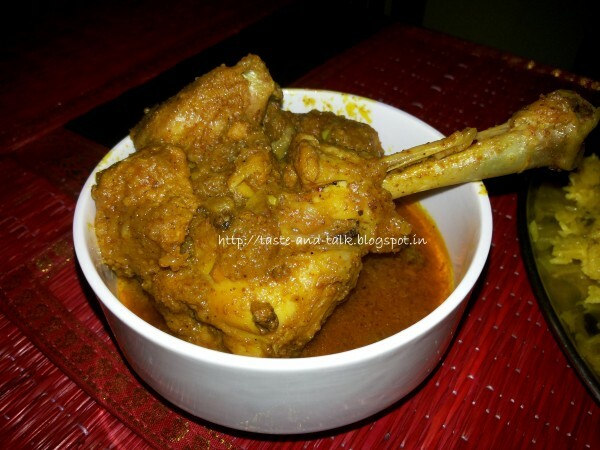 this blog is mainly about cooking and encouraging others to cook with some occasional posting on paintings,gardening,travelling.mainly inspired by bengali cuisine with some other recipes too.all the recipes posted here are very simple and easy to cook..but they taste delicious.so what more!try the recipes.happy eating ! 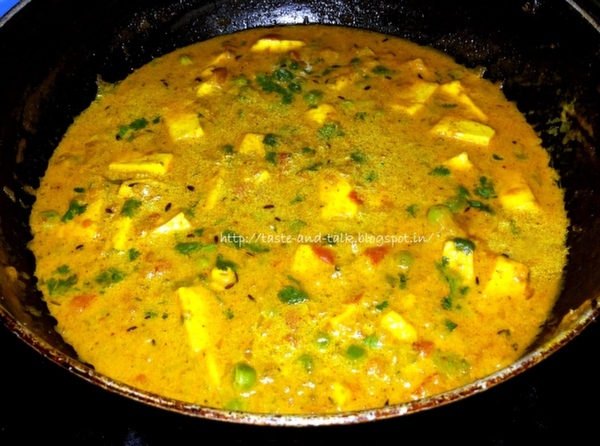 Matar paneer is a very famous paneer dish.I love this version of paneer because it consumes less oil and it is very healthy as matarand tomatoes used in this dish are very good for health.I have adapted this version from youtube khana khazana show.It is loved by all of my family members.So I am sharing the recipe here. Eid Mubaarak to all my readers.Finally after a long time I had got one holiday.The last holiday I got was in May for may day.I was tired and the eid holiday gave a so long cherished long weekend..Now I can happily blog :). I was so sick and tired of going to office and working everyday.The work pressure was so high and I was literally longing for a holiday.Last week was my dear hubby's birthday.Every birthday is special but this year the love of my life was turning 30! So I was excited and wanted to gift him something I never did before.I was inspired by the beautiful cakes made by my fellow bloggers and tried to give it a try! 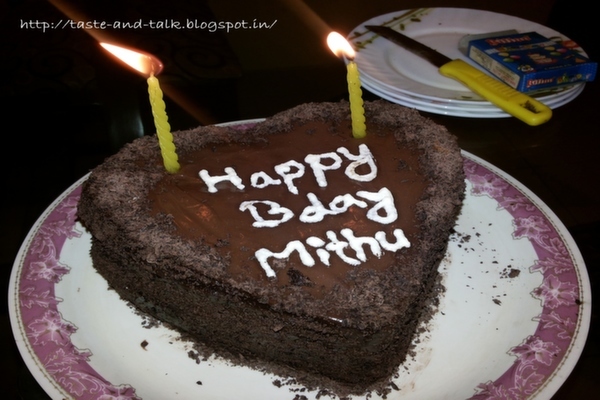 I always loved to bake tea cakes but I never made a cake with proper icing before.It is difficult to get whip cream in Bangalore which always discouraged me from making icing. So I decided to for a chocolate ganache cake with the easily available ingredients.Yet there is no compromise with the taste of the cake.Here goes the recipe. 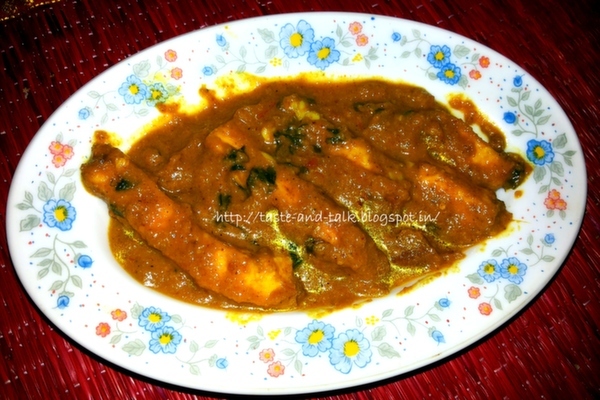 This is again another recipe from the cookbook 660 curries by Raghavendra Iyer. Nothing to say much about this dish as it is not only quite popular among Indians but out of India as well. I have modified the recipe little bit according to my taste bud and made it.Here goes the recipe. which said Razia Syed's Chicken with an almond yogurt sauce(Murghi Korma).I fell in love with it at the first sight.Normally Mughlai cuisines are famous with lots of cream,butter and rich staffs.This recipe has used simple ingredients with a life saving almonds and still so authentic and tasty.It leaves the gravy super tasty and rich without using any unhealthy ingredients. I made this dish with some changes.As I understood that the measurements and ingredients are mostly as per american standard.So I just indianized it with some changes.Instead of canola oil I have used mustard oil and also I have used normal turmeric and chilly powder to get some color.So here goes the recipe. Note : After making this dish I understood that this same dish can be made with paneer/potato or cauliflower instead of chicken.So my vegetarian friends can also try this out and let me know the result. I am very happy to announce that I have received this lovely accolade from one of my fellow blogger Sangeetha from eat n eat little more. She is a wonderful blogger and her blog is literally the treasure of good recipes. Thank you so much dear for this award! It keeps me motivated and inspired. The award needs to be shared among my fellow bloggers and I have to write one word describing myself. The word that describes me is hedonist. This dish does not need any introduction in India.Any Punjabi/North Indian or Mughlai restaurant would serve this dish.The rich texture is surely not for the heart patients or the people who are in diet.The combination of cheese,butter and cream will surely take you to heaven with every bite of it! So don't think and loose yourself in this buttery creamy gravyMy friends and family love this dish prepared by me.So I am sharing my way of doing this. I am first introduced with the concept of having biriyani with raita in Bangalore.Back home in Kolkata I just could not imagine biriyani without chicken chaap. It used to be like an indispensable part with Biriyani like bread and butter like biriyani and chicken chaap. 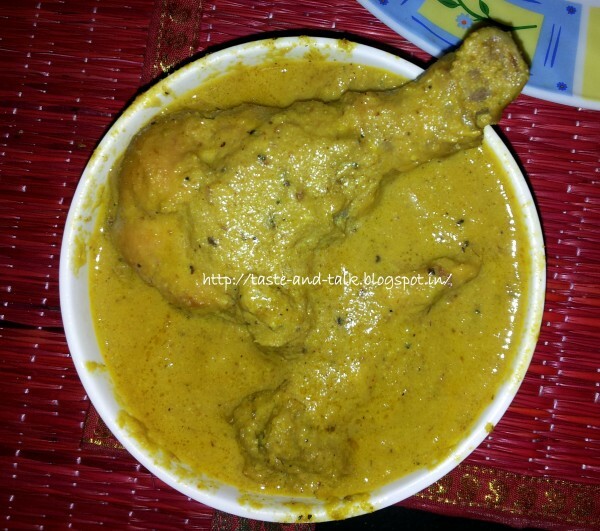 All the mughlai restaurants in kolkata like Aminia,Siraj,Nizam,Royal would serve this dish.My personal favorite among them was Royal's chicken chaap.The creamy gravy with rich aroma of the whole spices make this dish truly awesome.This is how I prepare this recipe at home which is quite popular among my family members. 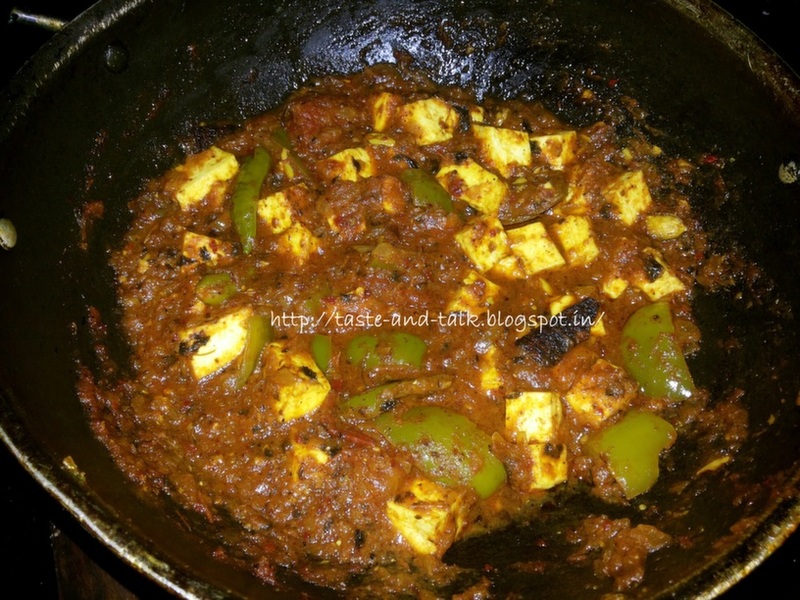 Kadai Paneer is a very favorite dish among Indians.It is very popular.The recipe is quite easy and quick.The taste is also heavenly.My friends and family members love this dish.The aroma of the freshly grounded spices and the creamy texture of paneer and capsicum makes it a delicious one.It goes very well with naan roti(for the recipe of naan roti click here).I am sharing the recipe here. I am immensely happy to announce my first award from my fellow blogger Pari from foodelicious.She is quite popular for hosting events.Also her blog consists of mouth watering recipes.A big thank to Pari for choosing my recipe Aam Pora Sharbat as a winner for Cook Like Mom event.I have received the award on last Monday but I am posting it late as I was not keeping well for last few days.The award was a cookbook named 660 Curries from Raghavan Iyer. I must say that this is a complete khazana of recipes.Everyday I am exploring new recipes. (C)http://taste-and-talk.blogspot.in/. Simple theme. Powered by Blogger.